Treynor Performance Index, invented by Jack Treynor is also known as Treynor Composite Performance Measure or Treynor ratio. It is a measure of reward (or excess return) per unit of risk. Treynor Performance Index = (Average Returns of Portfolio - Average Risk Free Rate) / Beta The formula uses the portfolio's Beta as the unit of risk. Reward (or excess returns) is measured as the difference between the portfolio's return and the risk-free rate of return over a period. The higher the Treynor Performance Index, the better the portfolio's performance. The TreynorPerformanceIndex worksheet calculates the average annual returns of a portfolio over a 5 year period. 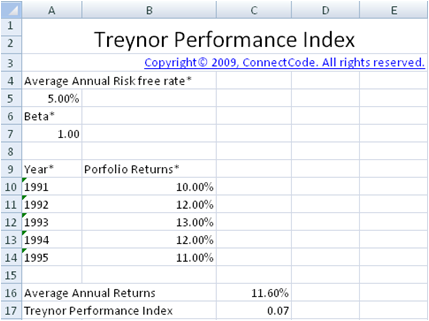 It then uses the specified Average Annual Risk free rate and Beta to calculate the Treynor Performance Index. The TreynorMultiplePorfolios worksheet calculates the Treynor Performance Index for up to 5 portfolios.